The Rear Foot Elevated Split Squat is a unilateral exercise (single leg mostly) that can first build stability and even out imbalances between legs. As you get stronger and start adding extra weight it builds strength that carries over to the bilateral lifts (Squats, Deadlifts etc..) You get the added benefit of getting a great stretch in the rear leg (quad and hip flexors) and single leg training puts less stress on the spine because of the split stance, and body position. How to do it? 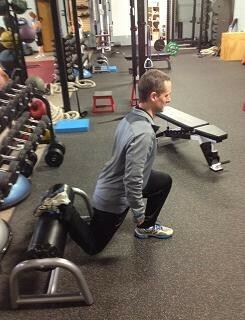 Don’t have a single leg squat stand like we do at Precision Fitness no problem. 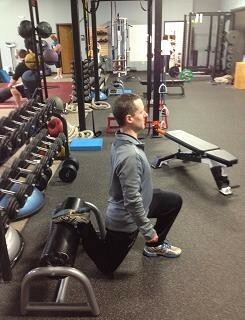 Use a bench, ottoman, couch, plyo boxes, aerobic step risers. The height will obviously vary with each implement, see which one feels the best. Lower boxes will be easier because of less range of motion than taller boxes which creates more range of motion. There are two ways to execute the exercise which are shown below. 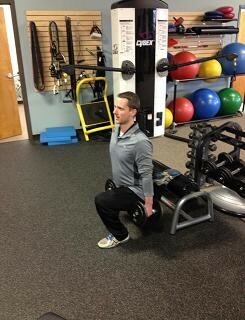 Quad dominant- Staying in a more upright posture loads the quads. 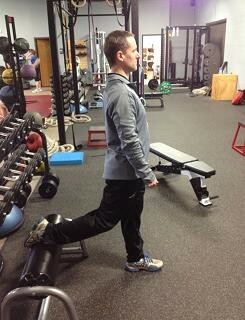 Hip/ Glute Dominant- Sink into the hip and lean your torso forward loads the glutes more.